“Everyone has that one can of soup on their shelf they’re never going to eat,” said Kelsey Winters, a junior, and she has a great place for you to take it. 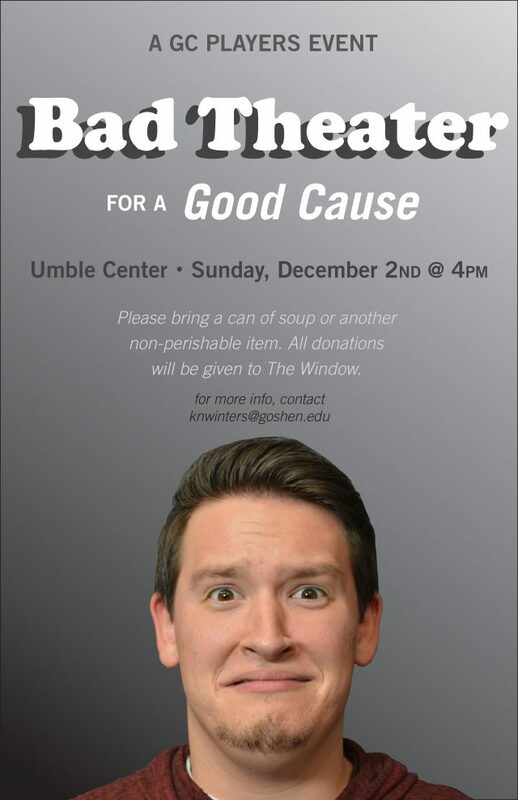 Goshen College’s GC Players Club will be hosting the inaugural “Bad Theater for a Good Cause” event on Sunday, Dec. 2, at 4 p.m. in the Umble Center. This event is open to the public and the entry fee is a can of soup or any other non-perishable item. Attendees of the event can expect goofy musical numbers, as well as a dramatic reading, a live puppet show and improv. The idea for a production with community good in mind came to Winters a year ago. As a peace, justice and conflict studies major, she says she is always trying to find ways to combine her love of theater with her passion for social justice. After talking it over with the other members of GC Players, a student-run club that branches off from the theater department, they decided to make the event official. As planning took shape, it was very important to the GC Players to be able to make a positive contribution to the community as well as making the event accessible to everyone. Asking for a can of soup in return for a seat to the show seemed like a good way to achieve this goal. All the items collected at the event will be given to the Window. The Window, located in downtown Goshen, is a non-profit faith-based organization that provides services and necessities to people with limited income. In 2017, the Window celebrated 50 years of serving the community. But there is more to this event than community service. The show has been designed to entertain. “[The acts don’t] have to be good, [they] just have to be fun,” Winters said. Everyone in the group has learned every role in the song in preparation. Bek Zehr, a sophomore musical performance major, is part of an act organized by Becca Choi and Anne Buckwalter. Along with a number of other students, they will be performing a song spoofing the style of GC’s Women’s World Choir. “This is, like, the wrong way to do Women’s World Choir,” Zehr said. As the choir sings music from around the world, the act will be singing Africa by Toto. Laura Miller works as the arts editor for the Record. She is a second-year student double-majoring in English and Spanish. Reach Laura at lymiller@goshen.edu.